After a rich life and career filled with music, Ronald Knudsen died peacefully at home this week, age 83. Known chiefly as a BSO violinist, also conductor and educator, he devoted himself to bringing classical music of all kinds to the widest possible audience. Born in Nebraska and raised in Minnesota, he studied at the MacPhail School of Music in Minneapolis and the Peabody Conservatory in Baltimore. Following Peabody, he was a Tanglewood Music Center Fellow, where he served as both concertmaster and soloist. 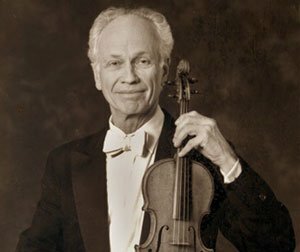 Before coming to Boston, in 1965, to join the Boston Symphony violin section, Knudsen was a member of the Baltimore and Detroit Symphony Orchestras. In Boston he was active in many activities of the classical community. He was the original violinist in the contemporary group Collage, and in 1971 helped found the Curtisville Consortium, a chamber music ensemble of BSO players and friends performing each summer in the Berkshires. Knudsen also was a soloist with the Pops, Brockton Symphony, Newton Symphony and Worcester Orchestras. In August 2013 he retired from the BSO, after 48 years of service. As a conductor Knudsen led orchestras throughout New England, also in Japan. Locally he served as music director of the Brockton and Newton Symphonies prior to being invited to direct the New Philharmonia Orchestra. In June 1990 he made his conducting debut with the Pops and was a regular guest conductor with them and the Esplanade Orchestras for more than 10 years, in addition to other chamber and pops orchestras around New England. Knudsen received acclaim for his programming, conducting skill, and his ability to bring professional standards to nonprofessional orchestras. Knudsen was as well sought after for his skill in restoration of old string instruments. His appreciation for high-quality craftsmanship showed in restoration work he performed on his 1878 Victorian. Ron leaves his wife, of many years, Adrienne Hartzell Knudsen, two children from a previous marriage, Sato (himself a BSO cellist for over three decades) and Mayumi, and four grandchildren. There will be a memorial of Knudsen’s s life later this spring. An appreciation is on the New Philharmonia site here. A YouTube interview on the occasion of his BSO retirement is here. I am very sorry to learn that Ronald Knudsen died. I knew Ron for many decades, and performed with him and under his baton. He was a wonderful musician, a true professional, and most importantly, a real gentleman. My sympathies go to his wife Adrienne and son Sato, with whom I also played music together, and who share the personal and musical qualities of this fine husband and father.